You are so beautiful, any horse lovers dream. Hi there Raven! Happy Pet of the Day! What a beautiful Kentucky Mountain Saddle Horse you are, Raven, beautiful inside and out! Raven has lived with us for twelve years now, as of August 10th. She took away all my fears, She's part of me now, I cant imagine life without her, Raven is the best thing that's happened to me and keeps me happy. She loves to run, and has plenty of energy. I wouldn't trade my girl for the world <3 Thats why Raven is so special, she helped me get through all my fears. How blessed your human is, having a best friend and devoted companion, a comforter and soul mate in you. The joy and peace, the comfort and love you bring to your mom/dad's days is truly a priceless gift. What a treasure you are, Raven, not simply worthy of the title Pet of the Day, but Pet of a Lifetime! Many thanks to your human for sharing your heartwarming backstory and all of those beautiful photos with us, giving us the pleasure of honoring one very special girl! I hope you enjoy a very special Pet of the Day celebration, taking a leisurely trail ride with your human, the two of you sharing a juicy apple, being loved and pampered to pieces! Lots of love and a big hug to you, beautiful Raven, our very special and most deserving Pet of the Day, EVERY day! 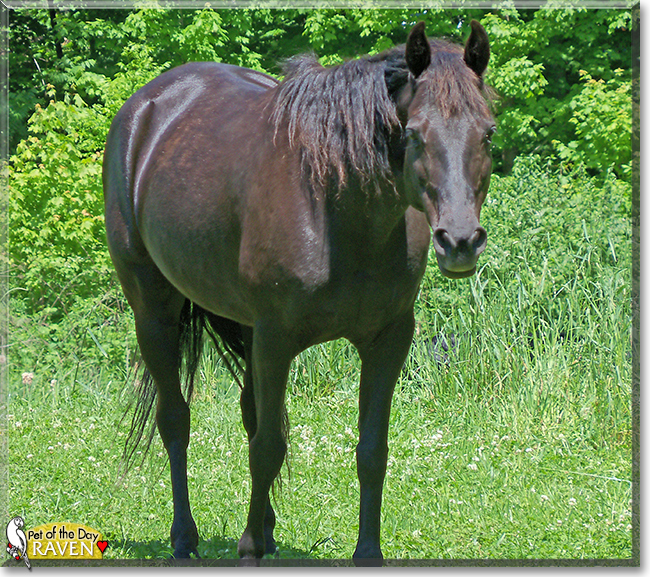 Raven is the most beautiful horse and she is simply perfect for you. It was wonderful to see her photos, I hope you two have the most excellent and special day! Dearest Raven, you are gorgeous! What a stunning Kentucky Mountain Saddle Horse you are! You are the best friend ever for your dear young person. You took away all his/her fears, and you have done wonderful things together such as competing in 4-H and doing trail rides. You and she/he love each other dearly, don't you. What a delightful love-filled home you share! 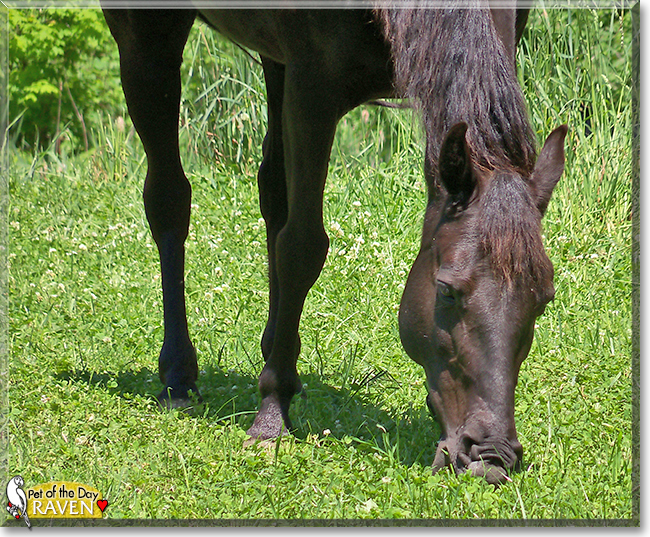 Congratulations, darling Raven, on being chosen today's Pet of the Day! We hope you and your dear young friend and all your family and friends are enjoying a fine celebration, full of fun and lovies and all your favorite games and treats. What a beautiful Kentucky Mountain Saddle Horse you are, Raven. Congratulations on being Pet of the Day!